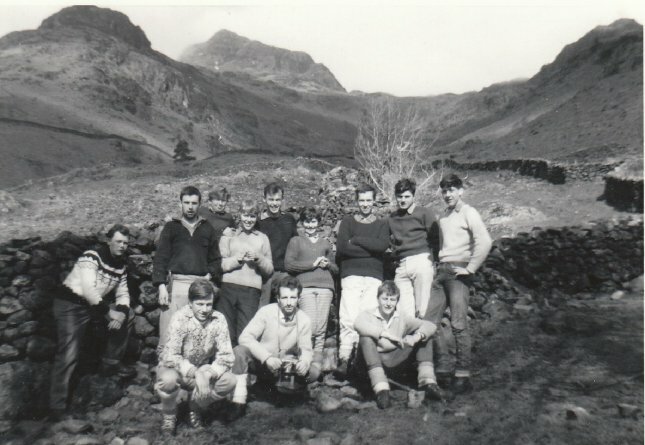 The Lake District soon drew us back: at Easter 1962 we made our first Youth Hostelling visit. Although the trip has remained firmly fixed in my memory, I discovered in 2007 that John Parker had written a log book at the time, and that his contemporary record differs here and there from my recollections. I readily defer to the greater accuracy of his details, but here is a rough outline of the trip. We set off on Good Friday, taking the bus from Otley to Shipley and trains to Windermere. Part of the journey was passed in the guard’s van, ticketing arrangements having somehow defeated the organisational ability of British Railways. 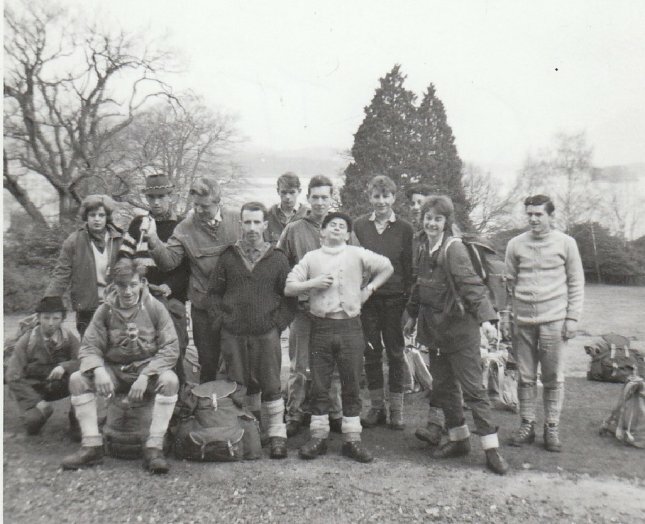 Late booking meant we had successive nights at Ambleside, Derwentwater, Hawkshead and Grasmere Youth Hostels. A glance at a map shows this was far from ideal, but we were going to have a good time, come what may. By personal choice next morning, some took a direct route to Derwentwater while the rest of us walked to Ullswater. Sandra developed blisters en route, so she and Paddy took the bus into Keswick. As we started up Sticks Pass, Robert decided he’d follow the girls and thumbed his way to the hostel. The remainder struggled upwards into deteriorating weather, and eventually returned to the same valley. Some caught buses to Keswick via Penrith, arriving late at night. Others had another go at Sticks Pass but retreated again and thumbed a ride to Keswick. Everyone was safe, but what a performance! Next day we made the long haul south, over Greenup Edge and through Ambleside, to catch the ferry at Waterhead. We got there just in time, and then we had a painful walk on sore feet to Hawkshead Youth Hostel. Our easy hike to Grasmere made up for that, and the delights of Merrydown cider that evening brought out the silly side of some of our more staid and senior members. All in all we had a great time and couldn’t wait for the following year. 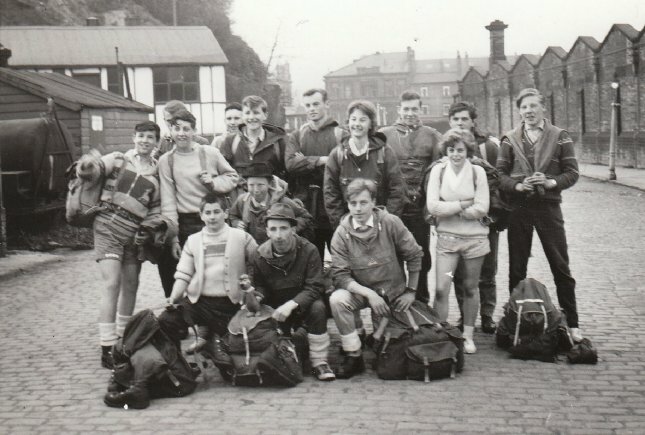 At Easter 1963 we set out again for the Lakes. I think this time we hiked from Windermere station to Patterdale Youth Hostel. Next morning at the breakfast table the warden banged a ladle against the porridge pan to gain our attention. He warned us of dangerous conditions on Striding Edge and said the authorities advised against attempting the ridge. Swirral Edge, he announced, was slightly less hazardous. He summarised by saying that we should avoid Striding Edge altogether, but if we chose to ignore him we should go up it, but not down it. An hour later most of us were on our way towards Swirral Edge, where we made a path through the cornice of wet snow and reached the summit of Helvellyn, after which it was an easy walk down the hill and into Keswick. Next day we headed up Borrowdale and were just outside Rosthwaite when the first raindrops fell. Continuing along Langstrath, the clouds were lowering, but we set a good pace through the spreading pools of water. We easily crested Stake Pass and sloshed down into Great Langdale, the heavy rain soaking through our anoraks and running down our necks. Nobody had much to say, probably because we were heading for a rendezvous with Dad and the Dormobile, which was full of camping gear. That Easter Sunday we couldn’t find a hostel anywhere, so we faced an evening and night in a tent in a soggy field. Dad was waiting for us at Dungeon Ghyll, and Mary and Denise Parkington had come along for the ride. We arrived in dribs and drabs, and as we began to erect the tent someone noticed John Parker and Vowlesy were missing. We cursed them roundly: they’d opted out of the previous day’s hiking, which we felt went against the spirit of the trip, and now they’d deserted us while we pitched camp. The tent was dropped and packed in seconds, and we followed them to a barn attached to a farm house on the side of the valley. The farmer had given them permission to shelter, and we took off our wet gear and spread or hung it for a slim chance of drying. The gas burners were soon cooking dinner, and our world seemed very much better than a couple of hours before, while outside the rain still poured. Dad and the girls retired to the Dormobile, and we settled down at a normal Youth Hostel bedtime. An hour or so later there was a rattling at the door, and in came four climbers who had spent the evening in the pub and couldn’t now cross the swollen Stickle Beck to return to their tents. We made such arrangements as we could for their comfort, and then we got some patchy sleep. Later we were joined by campers from the field where we had briefly pitched our tent, and at daybreak we looked out on a flooded valley, lit by bright sunshine from a cloudless sky. When breakfast had been cooked and all was tidied up, we hikers said farewell to the Transport Corps and headed towards Coniston for the last night of the trip, confident that all our misfortune was behind us. For once we were right. One thing the trip proved was that we could handle serious hikes in the Lake District, and we travelled home on the train with an air of confidence. As we reflected on our achievements, Neil posed the question: What next? I thought about a book I’d been given for Christmas.